In Part 2 of this article, we’re going to tackle both of these assumptions. Let’s get started! This is just false. There is no “theory police” that’s going to give you a ticket or lock you up if you break the rules. Knowing the rules and following the rules are two entirely different things. Moreover, music theory isn’t just about rules. 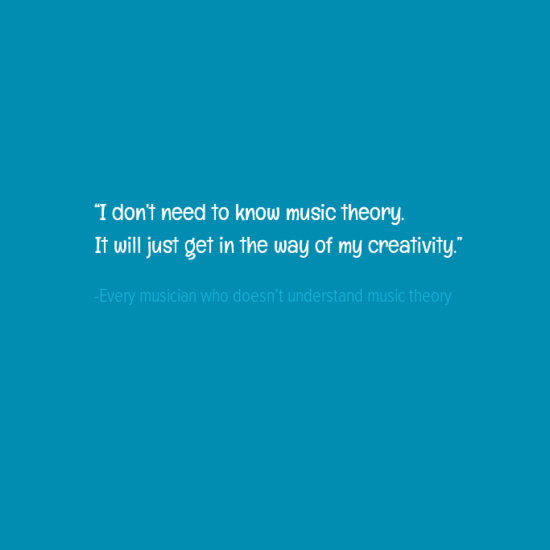 Music theory allows you to label sounds and ideas, making them easy to communicate to yourself and others. Creative ideas are fleeting. If it’s not written down, it could be lost forever. Say you come up with a musical idea and don’t have time to record it. Sure, you might be able to remember it, but studies show that memory is never an exact replica of the original thought. Music theory provides you with a vocabulary, which allows you to communicate easily with other musicians. Ever try to communicate with someone who didn’t speak a word of English? How did you do it? Draw pictures? Point to objects? Act something out? Sure communication is still possible. That said, think of all the time and energy that would be saved if you already spoke the same language. This is also false. Although I’ve been calling them “rules,” they’re really just guidelines. Think of “college ruled” notebook paper. In this case, the rules (lines) really are guidelines. Let me ask you a question: Does lined paper ruin your creative writing? No. It doesn’t affect the content whatsoever; it just makes it look more organized and legible. This is exactly what theory does. It actually makes everything easier! It is strongly recommended that you do some composing strictly within the guidelines when you are first learning to apply music theory. As a result, this music will end up sounding like things you’ve heard before; hence, unoriginal. This is merely a stepping-stone as you enhance your musicianship. Think of these as exercises. You don’t have to try to sell this stuff, but you certainly can if you’d like. Either way, it as a learning experience. If originality is a legitimate concern for you, then I would suggest never listening to anyone else’s music ever again. Every piece of music that you have ever heard has, in some way, influenced the way you play and compose. So really, it’s already too late. You will never be 100% original. Music theory can actually help with your originality. Through music theory and analysis, however, you can identify exactly what is and isn’t original. A few years back, guitar virtuoso Joe Satriani nearly sued Coldplay for ripping off one of his songs. Someone actually analyzed the music theory to compare similarities and differences, creating a clear case of musical plagiarism. Check it out!